Click on the image to view the fourth episode of this season’s “RJ TV,” on August 1, 2011. Watch Residents’ Journal’s reporter Quintana Woodridge talking with UYIJP student Tyreshia Black talking about her reports on the environment and a trip she took to the Shedd Aquarium this summer. 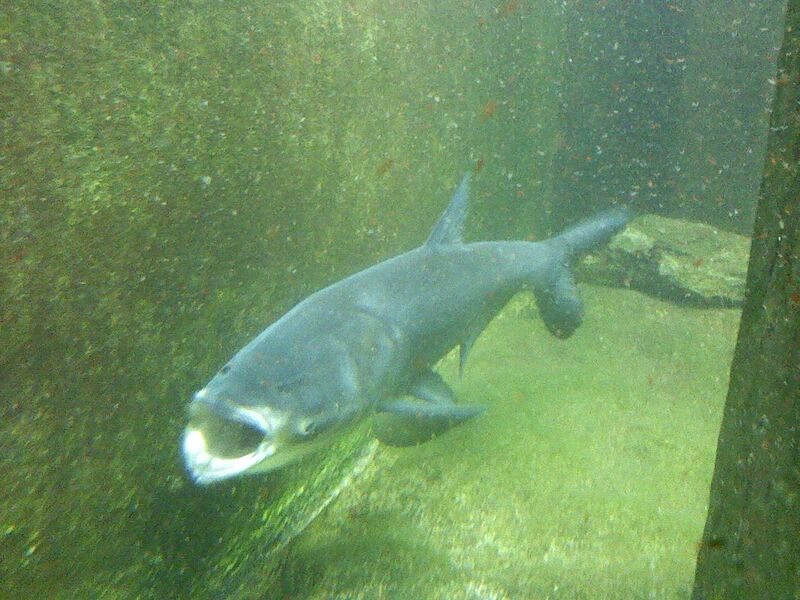 An Asian Carp. Photo by Tyreshia Black. I got a chance to visit the legendary world of wonders at the Shedd Aquarium recently. The aquarium holds multiple exhibits of all types of fascinating animals. When my colleagues, journalism teacher and I arrived at the aquarium, we were introduced to Melissa Kruth, the public relations manager and Jillian Braun, a new intern. The two polite employees walked us through the huge crowds of busy people trying to view the beautiful creatures in each exhibit. Braun and Kruth directed us to Kurt Hettiger, the senior aquarist at the Shedd Aquarium. He has worked there for approximately 19 years, two years as an intern and 17 years as a full-time employee. Hettiger has been working with mainly invasive species and endangered native animals including fish. Invasive species have been invading and intruding into large open areas of Lake Michigan. 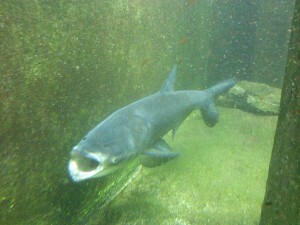 The most recent invasive fish categorized as an invasive species is the big head carp, which is a kind of Asian carp. You see the line getting straight and moving around, so you start reeling it in. The fish tries to pull away, but eventually it comes up. Fishing in Burnham Harbor by Shedd Aquarium on July 6, the fish I pulled up were round gobies, bluegill and bass. Round gobies are an “invasive species” that eat the plankton and food that other fish need and they like to stay at the bottom of the lake. Invasive species come from another part of the world, like another lake or ocean, and they eat the other fishes’ food and cause a lot of trouble. Before we went fishing we went to the Shedd Aquarium where we were talking about silver carp and big head carp, which are both types of Asian carp. They are also invasive species, coming to the Great Lakes up the Illinois River, but they are originally from Asia. Some things make them startled and make them jump out of the water, including loud noises that the boat motors make and rocks thrown in the water. When they jump out of the water they are so big that they hurt people they hit, sometimes seriously.